Veteran tight end Heath Miller has decided to retire, the Steelers announced today in a press release. Miller, a two-time Pro Bowler, will call it a career after spending 11 seasons in the NFL, all in Pittsburgh. Miller, 33, begain his career back in 2005, when the Steelers selected him with the 30th overall pick in the draft. The Virginia product immediately became a starter, and appeared in 168 regular-season games (167 starts), plus another 15 playoff contests, for the franchise over the next 11 years. Miller’s best years came in 2009, when he caught a career-high 76 passes, and in 2012, when he racked up 816 receiving yards and eight touchdowns. However, he remained productive for the Steelers until his final season, totaling 60 receptions, 535 yards, and two touchdowns in 2015. No tight end in franchise history accumulated more total catches (592), receiving yards (6,569), or receiving touchdowns (45) than Miller. With Miller set to move to the Steelers’ reserve/retired list, the team will no longer be on the hook for his $4MM base salary for 2016, which would have been the final year of his current contract. That frees up some cap space for Pittsburgh, but the club will have to find a way to replace the veteran’s production. 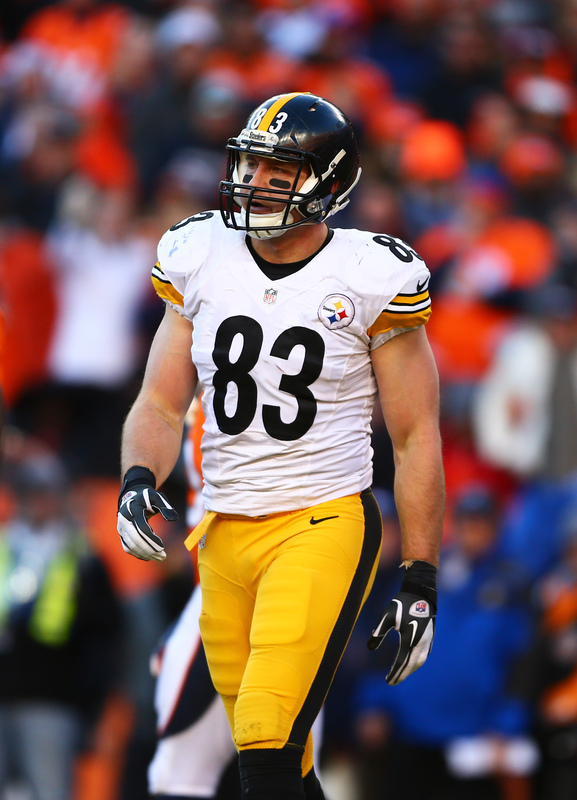 Matt Spaeth and Jesse James also saw playing time at tight end for the Steelers in 2015, and both players remain under contract going forward, but they combined for just 10 receptions between them. While the duo will likely get a chance to compete for increased snaps in 2016, the Steelers figure to address the tight end position in the draft and/or free agency. The Steelers have restructured the contracts for three of their players, freeing up $6MM in cap space for 2015 with the moves, according to Adam Schefter of ESPN.com (via Twitter). Schefter reports that wide receiver Antonio Brown, tight end Heath Miller, and kicker Shaun Suisham all had their deals reworked. The most interesting move of the three is the Steelers’ decision to rework Brown’s deal. Per Mike Garafolo of FOX Sports (via Twitter), it’s not just a simple restructure for the star wideout, who had been seeking a new contract this offseason. Brown won’t get a significant raise or extension, but Pittsburgh has moved up $2MM from his 2016 base salary to 2015, making it part of a new signing bonus. While specific details on the other restructures haven’t yet been reported, I would expect Miller and Suisham to have a portion of their 2015 base salaries converted to signing bonuses. Miller had been set to earn a $4MM salary this season, while Suisham would’ve earned a $2.595MM salary. According to Schefter (via Twitter), the Steelers intend to use the majority of their newly-created cap room to offset the large number of injured players they have counting against their cap this year. One of those injured players is Suisham, and today’s moves were likely necessary, in part, to help accommodate the salary of kicker Josh Scobee, acquired by Pittsburgh yesterday from the Jaguars. Why should Joe Namath have all the fun? Last night, Deion Sanders took an opportunity to spark a controversy with his former team. Without giving specific details, NFL Network analyst said he is hearing the 49ers players no longer want to play for coach Jim Harbaugh, as Matt Maiocco of CSNBayArea.com writes. “They want him out,” Sanders said Sunday night after a recap of the 49ers’ 26-21 victory over the Eagles. “They’re not on the same page.” Maiocco notes that Sanders is particularly close to wide receiver Michael Crabtree, who is in the final year of his original six-year contract. More on Deion and other items from the NFC West.. Meanwhile, Harbaugh didn’t mince words in his response, as Paul Gutierrez of ESPN.com tweets. “Personally I think that’s a bunch of crap,” said the coach. Seahawks tight end Zach Miller underwent an ankle procedure last week, multiple sources told Ross Jones of FOXSports.com. Miller is expected to be sidelined with the injury an extended period of time but he can’t be placed on the IR-DTR since that spot was already taken by cornerback Jeremy Lane. Miller should be out five to six weeks, Ian Rapoport of the NFL Network (on Twitter) hears. Meanwhile, Chris Mortensen of ESPN (on Twitter) hears he’ll miss just two games after the bye. The Bengals have a deep bench at the running back position, and it is unclear how many the team will keep on the 53-man roster, writes Coley Harvey of ESPN.com. Harvey says that both BenJarvus Green-Ellis and undrafted free agent Jeff Scott are on the bubble, with Giovani Bernard and second-round pick Jeremy Hill looking to take a bulk of the carries. However, Green-Ellis’ veteran presence and Scott’s versatility could keep them on the roster this season. The Browns still plan to let first-round pick Johnny Manziel start as a backup, and if veteran Brian Hoyer plays well the team could extend him, writes Pat McManamon of ESPN.com. With Manziel on his rookie contract for four years (with a fifth-year option), the team could afford to keep both players. WEDNESDAY, 11:23am: The restructure has added two new years to Miller’s contract, according to Tom Pelissero of USA Today (Twitter link). The new deal includes base salaries of $4MM in 2015 and 2016, while 2014’s cap number has been reduced to about $6.133MM, a reduction of $3.33MM. MONDAY, 10:47am: The Steelers have restructured Heath Miller‘s contract in order to create 2014 cap space, reports Ian Rapoport of NFL.com (via Twitter). Miller had been a strong candidate to be restructured or released due to his $9.47MM cap number. That cap hit will be reduced, though the specific details aren’t yet available. Miller’s contract called for a $6.02MM base salary in 2014, to go along with a prorated bonus amount of about $3.45MM. That bonus amount can’t be adjusted down any further, but the base salary could be reduced all the way to the minimum. 2014 was slated to be the last season of Miller’s deal, so it’s not clear yet whether the new agreement will add any extra years to the contract, or if Miller agreed to take a pay cut. If there are new years on the deal, it’s also possible they’re voidable, which would still allow the tight end to become a free agent next year. The Steelers are among the teams with the most money committed to the 2014 cap, meaning Miller’s deal likely won’t be the last one the club restructures. Even with a higher than expected $133MM cap for ’14, the Steelers may have limited flexibility to bring back their own free agents and add new players. While the Bengals‘ secondary is thought to be a strength, Joe Reedy of Cincinnati.com believes the team could still target corner at some point in the first few rounds of the NFL Draft. With Leon Hall coming off his second torn achilles in 23 months, Terence Newman entering the final year of his contract, and Adam Jones approaching his 31st birthday, the team does have question marks at the position. Former first-round pick Dre Kirkpatrick has improved, and while the need for a starter is not imminent, in a passing league teams can never have enough guys who can cover.